Northwest Motorcycle Exhibit: Show your bike! We will contact you within a few days after receiving your submission and provide load in instructions a week before the show. We're limited to just 20 motorcycles, so please submit your bike sooner than later. Since 2001 Sound RIDER! 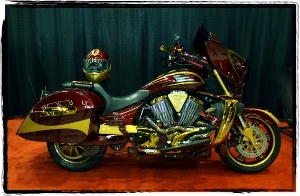 has put on the Northwest Motorcycle Display during the International Motorcycle Show stop in the Pacific Northwest. Year after year, it's one of the highlights of the event. We'll be doing it once again this year when the show moves to Portland. We're on the lookout for unique, interesting, one-of-a-kind motorcycles for the upcoming show. All types of bikes are welcome. Over the years we've shown cruisers, sport bikes, rarities, trikes, scooters, mini bikes, racing sidecars, drag bikes, rat bikes, cafe racers, dirt bikes, land speed racers and a lot more. Anything that goes! Owners whose bikes are chosen for the show will receive a weekend pass to the show as well as an additional Friday and Sunday admission so you can bring a helper along to deliver and pickup your bike.